How much pride would you feel if you and your spouse were sitting in the living room and all of a sudden your child burst in like gangbusters holding a big award with a mile-wide smile on his or her face? Well, that’s what happened to Shelby the squirrel’s parents in Kathy Stemke’s newest children’s book: “Trouble on Earth Day”. Shelby crashes through the front door waving her first prize ribbon for winning the Earth Day poster contest. She shows her parents the big poster with the words Rethink, Reuse and Recycle on it. Soon the whole family gets involved with recycling household items. Shelby hears a homeless bluebird crying in the forest and sets out to help him. The workmen had cut down the bird’s tree and nest. Can Shelby help his new friend and the Earth too? This wonderful book makes possible a three way dialogue between parents, teachers and students about conserving the Earth’s natural resources; done in a simple to understand fun way. Besides the whimsical tale featuring Shelby the squirrel, there is a big 22 page supplemental activity section featuring songs, recycling crafts, worksheets, games, and even compound word activities. Teachers and home-schoolers everywhere will appreciate the vibrant discussions on trees, birds and recycling materials; facilitating the exposition of knowledge to children in a positive, caring manner. Included in this delightfully interesting book is a history of Earth Day, which will reinforce the young scholars’ understanding of the value of environmental responsibility. “Trouble on Earth Day” by Kathy Stemke is a fabulous tool for educators and parents, sure to instill superb solid values in young people. Now what would Shelby’s favorite meal be? One food that always seems to get recycled, to the delight of all, is that big roasted turkey. This fragrant delicious turkey hash is now ready to serve. Tuck in and enjoy it. Many folks like this for a breakfast meal with poached or fried eggs atop the hash. But don’t worry about it, this hash is good anytime. Shelby’s mom says to save that turkey carcass, because you can make an excellent broth with it. This broth is great for soup, to boil rice in or cook soaked dried beans in. Shelby’s dad says this is a win-win deal, and don’t forget to put those peels and vegetable and fruit trimmings in your compost bin. What a great way to teach why we need to recycle and save our Earth!! What a sweet Hubby you are to toot her horn. LOL!! And you cook too! You are both keepers as Joanne put it. Sounds like a great book! And that recipe too! Must try now that I have started to cook again. JOANNE: Thank you, she is. MY JOURNEY: They don't call her the education tipster for nothing. They you for your kind words. TORVIEWTORONTO: Thanks for calling. Read your post about yo yo's. Emjoyed the other one about cooking with children. KALYANI'S PLATTER: It's a delicious way to serve turkey. looks great! wow what a great book! NOEMI: Although this is a leftover turkey recipe, a lot of folks like to prepare it for breakfast, but it is good anytime. Enjoy. SARAH NAVEEN: Thank You, it's a great book for children; the hash is very good. PEGASUSLEGEND: Thanks for saying so, I certainly agrfee with you. It seems very interesting this book Kathy. Undoubtedly it has to face a new educational perspective to raise awareness to new generations on the conservation of the environment. Hello This is a test this is only a test and may be removed at your convienance. Signed Scott Engstrom Testing COnsultant of Demorest GA.
Kathy and I are very grateful for your comments. LEOVI: Thanks for your encouraging words. KALYAN: I totally agree. Thank You. Loved your wife's poem, too. Thanks for leaving it on my blog. KITCHENMORPH: Thank You for those kind words, I appreciate them. ANGELA FELSTAD: Thank You for calling. MIRIAM: Nice of you to say, Thanks. Turkey for breakfast is a very healthy practice! I love recycled turkey dinners! The book sounds wonderful! If I were back in the classroom I would use it! STEPHANIE: Thank You, it is a good book. Kathy's little children from thirty years ago have called her recently and expressed what a difference she made to their lives. As an educator yourself I know you can appreciate that. Ahh! I always come by here when I'm hungry! Big mistake. After signing off, I'm going to get me some lunch. 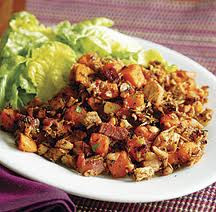 I don't have the ingredients for turkey hash (looks YUM), but I'll figure something out! Kathy's book sounds very timely! Cheers to Shelby doing things to help save our planet! SAMANTHA: I love your complementary comments, thank you very much. Kathy's book is marvelous for kids, and the Shelby metaphor is timely and most welcome. That island you visited is lovely. Hey, remember those French footballers in the pink uniforms? Do the fans have tailgate parties at the stadiums like here? This sounds like nice book. Recipe looks delicious too. UMA: Thank You for calling, yes it's a nice childrens book. The hash is very good too.